So I finally went and done it – I finished The NOD Companion for Blood & Treasure. What is it? 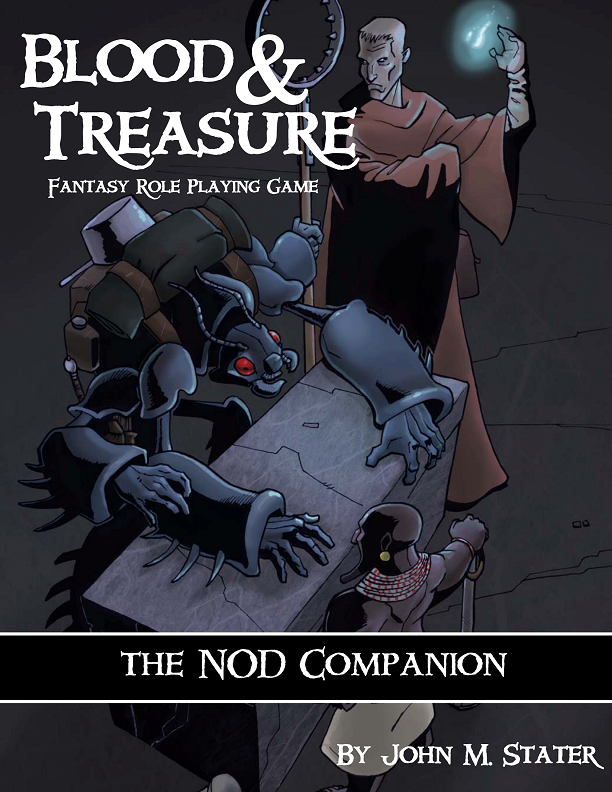 This supplement for the Blood & Treasure RPG collects in one place articles that players will find useful from NOD Magazine, including more than a dozen new character classes, new character races, new spells, new equipment and several optional rules to help customize your game experience. 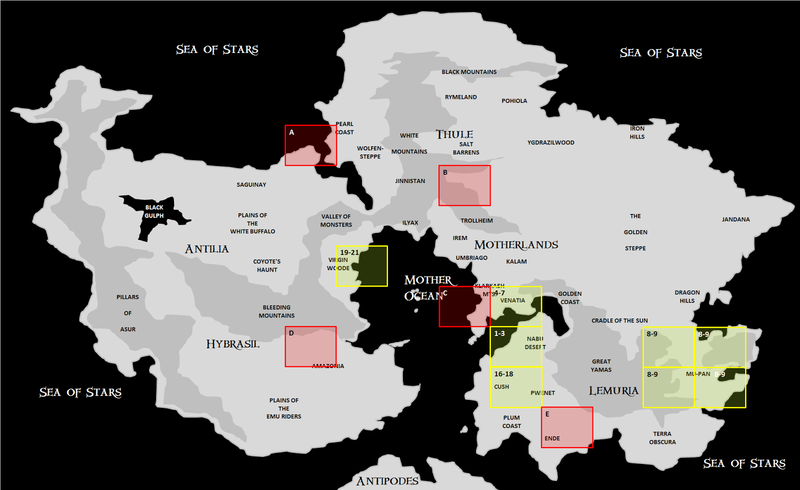 You’ll also learn the history of the NOD campaign setting and get a glimpse at just how large that setting is! So, if you like extras for role playing games and you like Blood & Treasure, you might want to look into grabbing this book. AND – if you buy the hard cover, I’ll throw in the PDF for free. Just send me an email (check the right-hand column) with a copy of the receipt. That deal’s so good, I must be CRAZY! A good way to end 2013, now I need to get busy writing for 2014! Where Should NOD Go In 2014? Hey all – I’m finishing up NOD Companion and NOD 22, and I need to start thinking about NOD 23. NOD 22 will be the first issue of NOD without a hex crawl – instead I’m doing a couple adventures, one being Dungeon of the Apes and the other a zombie plague adventure for Mystery Men!. NOD 23, however, will return with a brand spanking-new hex crawl, and I want you folks to decide what I’m writing. A – Sea of Divils – A little slice of Hell on Nod – a shallow sea controlled by devils and their followers and flanked by the cities of the strange people of the Pearl Coast. B – Azsor – When a dwarven messenger stumbled into the camp of a hill chief called Mogg, little did he know he was helping to found the kingdom of Azsor, a kingdom where dwarves and human live together and a kingdom threatened by giants, trolls and the wild men of the steppe. C – Klarkash Mountains – The Klarkash Mountain are not only home to the kingdoms of the hobgoblins and the human city-state of Guelph, but also to an underworld where the drow are the least of one’s worries. D – Amazonia – A fetid jungle basin inhabited by the former slaves of the ancient elves, human and otherwise. In its midst is the secret city of Tara-Tilal, the last stronghold of the ancient elves. E – Ende – The dusty plateau of Ende holds four warring city-states, each ruled by a monster in search of the ultimate power that lies at the center of the plateau. So, one and all, if you have a preference, vote below. Whatever gets the most votes determines the next stop I’ll be taking in the Land of Nod. Oh, and if you want to see the map sans boxes, here it is. I tried. So help me I tried. But I just couldn’t get into the thing. The idea was to do to the Modern SRD what I did with the fantasy SRD – i.e. turn it into a modern version of Blood & Treasure. The problem – I just couldn’t find the hook, the energy, the right feel that would make the thing gel. It’s tough to make something good if you don’t love it, you know. I was musing on what kind of RPG Ron Swanson would play. I know – ridiculous – but an hour on a treadmill can send the mind into all sorts of odd places. Of course, the answer is that Ron Swanson wouldn’t play an RPG. He is, however, the closest thing modern America has to a folk hero, and symbolic of a movement by modern men to get in touch with their roots. I needed a subject that I found interesting, fun and inspirational – and by Ron Swanson’s mustache, the manly adventure of yesteryear was going to be it. Surviving in the wilds, steering tall ships, plunging into the mysterious corners of the globe in search of loot, hunkering down in a trench, preparing to dash into the oncoming bullets of the hun! – that was the ticket. So, Action X is dead, may it rest in peace. I’m replacing it with GRIT & VIGOR – BOLD VENTURES FOR RUGGED FELLOWS. I’ve been writing the crap out of it for the last week, and think I can begin play-testing it on Google + in January and publishing it sometime in the Spring or Summer. 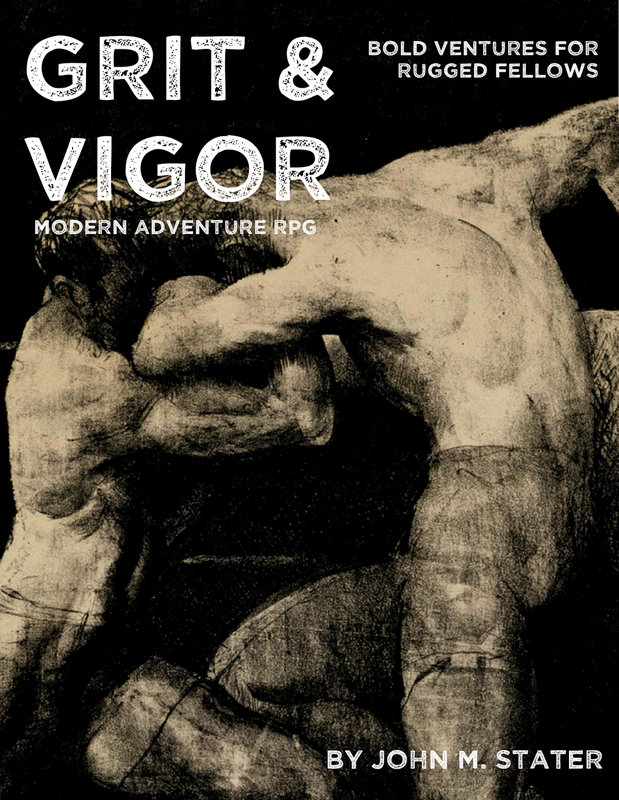 GRIT & VIGOR draws on the literature of Kipling, Conan-Doyle, Conrad, Hemingway, REH, London, Burroughs and their ilk. It’s about larger than life men going on adventures in search of money, power and freedom. Yes, women can play G&V – either as male characters (it is role playing, after all), or by flipping all the pronouns in the book from masculine to feminine – any woman worth her salt will do anything she likes with my game rules – she doesn’t need me to give her permission or molly-coddle her. Characters, also called “rugged individualists” in G&V, do not belong to a permanent “class”. Special abilities, skills and weapon proficiencies are handled with feats. You get several at first level, many of them are rolled randomly on one of four tables meant to represent your character’s background (you can Go Rogue, Go to School, Go to Work or Go to war), though the referee could allow players to simply choose them if they preferred. All of the feats are given one of four classifications – Mental, Martial, Red-Blooded and Underhanded. 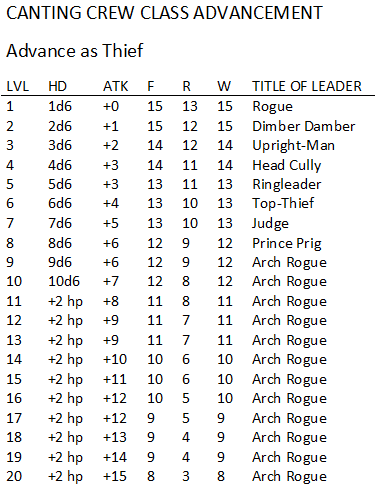 Whichever of those categories the majority of your character’s feats fall into determines your character’s “class” at that level, with their class determining what dice they roll for hit points, and what ability scores they can boost at levels 4, 8, 12, 16, etc. So, at 1st level, a character with mostly Martial feats is classed as a Fighter, and rolls 1d10 for hit points. By level 3, he may have more Red-Blooded feats than any other, so now he’s classed as a Daredevil that rolls d8 for hit points. Other than that, attack bonuses and saving throws are the same for everyone, though they are modified by ability scores and feats. Combat, saving throws and task checks work as they do in Blood & Treasure, as do hit points, Armor Class, ability scores, etc. Aerial combat and vehicle rules will be included, of course. 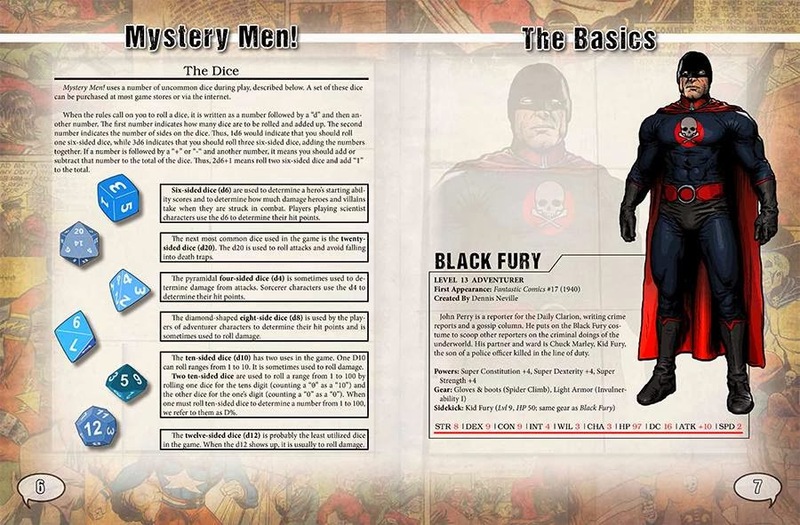 Psychic powers are included in the game, but are optional. 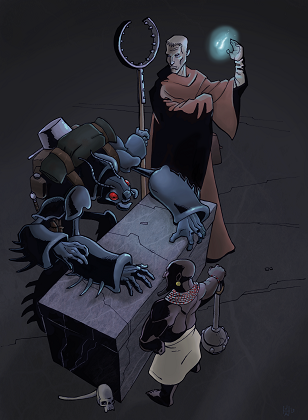 For opponents, the game primarily uses animals and human beings, but a few monsters (vampires, werewolves, morlocks) are included as well for those who want a paranormal or science-fiction element in their game. The game will also include what I’m calling an Almanac of Adventure. This will be a series of articles covering different time periods and genres that referees (Venture Masters) can use to build their campaigns. One might be “Wild West”, and will provide some tips and information relevant to that era, as well as any additional rules or equipment to run that setting. Another might be “Mystery”, and will discuss running mystery-oriented games. Hopefully you get the idea. There will also be “Steampunk”, “Atomic Super-Science”, “The Jazz Age”, etc. I’d also like to include an element of taking the manly virtues expounded on in the game and applying them to one’s real life. Maybe XP awards for overcoming real life challenges that players can apply to their characters – a good chance for members of a gaming group to support one another outside the gaming table. Sounds corny, I guess, but I am corny so I don’t give a damn! That’s the plan, ladies and gents. I’ll let you know when the playtesting is about to begin, in case you’d like to join in. With the power of the elves and dwarves broken, the world was left to the humans and their ilk. We now reach a time a scant five thousand years ago. As the dragons of Mu-Pan slowly retired into secret places, they left their scions in charge of their warring kingdoms. In time, they would be united in an empire that would have to tolerate numerous dynastic changes and revolutions and stand up to the machinations of the weird lords of Tsanjan. Thule harbored a rogue elven land called Pohiola. This nightmare kingdom would slowly give way to the invasions of the horsemen of the steppe, as they laid the foundations for such kingdoms as Mab, Luhan and Azsor. Antilia and Hybresail would remain largely wild places, home as they were to the shattered homeland of elves and dwarves, its human and demi-human populations reduced to barbarism. In the Motherlands and Lemuria, the human populations learned well from their former elven masters, and founded sorcerous empires founded on demon worship. In time, such empires as Irem, Nabu and Kolos would fall in spectacular eldritch fashion. In their ashes, a new empire was born that would rule much of the Motherlands – Nomo. Nomo was founded when a band of elven adventurers led by Prince Partholon left the shores of Antilia in a dozen longships and make their way to the Motherlands. Finding themselves among a tribe of human barbarians, they soon asserted themselves as their masters, founding the city-state of Nomo and eventually extending their control over much of the sub-continent. Under Nomo’s emperors and empresses a 2,000 year empire was begun which would end only with the disappearance of the Emperor during adventures in the mysterious West. With the emperor’s disappearance, Nomo fell into factional fighting, with each faction supporting its own candidate for emperor. The former tributary kings and queens in the empire also staked their claims on the throne. Thus it is in today’s land of NOD. City-states built on the ruins of kingdoms built on the ruins of empires, all threatened by encroaching chaos. 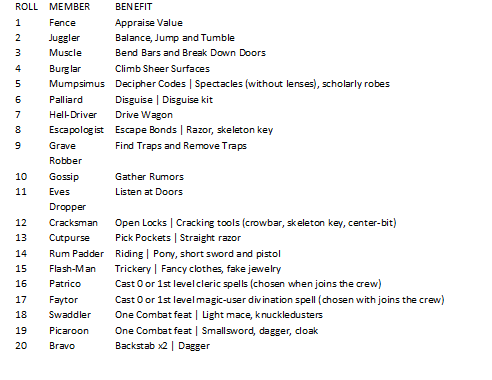 In Blood & Treasure, I introduced the notion of variant classes. These were meant to illustrate the way one might create new classes using old classes as a base, with fairly minor changes. Half-orcs often grow up on the mean streets, learning to excel not as trained fighters but as street brawlers. These half-orc thugs advance as barbarians, save for as follows: They may only use padded or leather armor and bucklers, they have the following skills: Bend Bars, Break Down Doors, Climb Sheer Surfaces, Gather Rumors, Hide in Shadows, Jump, Move Silently and Pick Pockets. Gallants are elven paladins as dedicated to romance and wooing women as they are to righting wrongs and protecting the weak. While most paladins can be a bit stodgy, elven gallants are rather dashing and devil-may-care. 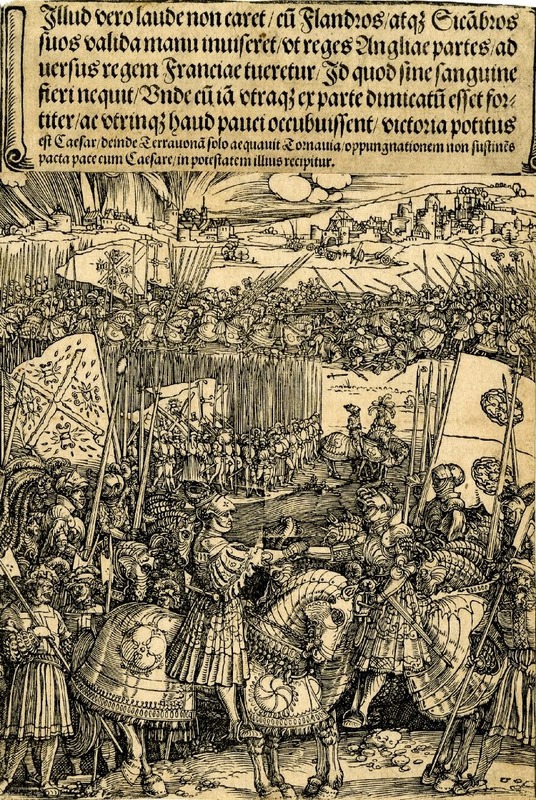 In a three-fold alignment system, gallants must be Lawful. In a nine-fold system, though, they need only be Good. Gallants cast spells from the bard spell list rather than the paladin spell list. As adventurous as dwarves can be, their first loves are always gold, gems and silver. Many, if not most, get their first taste of adventure as prospectors, heading into the hills or depths in search of metals or stones to mine. 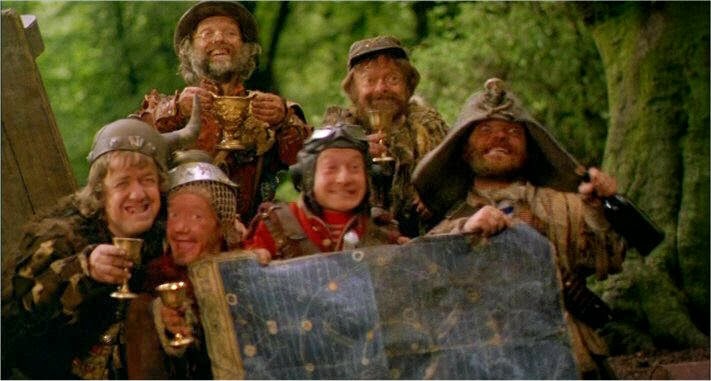 Dwarf prospectors have the following skills: Climb Sheer Surfaces, Find Traps, Hide in Shadows, Listen at Doors, Move Silently, Notice Unusual Stonework, Open Locks, Remove Traps and Spelunking. In addition, they can wield picks and hammers. Gnomes are innately magical folk, and some learn from a young age to tailor their magical abilities to the profession of thievery. These gnome thieves are noted for their enjoyment of taunting their victims with pranks and riddles, leaving calling cards and boasting of their thefts before they happen. In place of a gnome’s normal innate spells, a prankster can cast the following spells: Mage hand, open/closer and ventriloquism. Many of the halflings that people meet are of a breed known as the pikey – wanderers from the east who live a semi-nomadic life among the larger races, making a living telling fortunes, picking pockets, stealing pies (they love pies) and bilking the naive. Gypsies have the abilities of thieves, save they replace the backstab ability with the bard’s ability to fascinate. Their skills are as follows: Balance, Climb Sheer Surfaces, Escape Bonds, Gather Rumors, Hide in Shadows, Move Silently, Pick Pockets, Train Animals and Trickery.